My family came down to Austin for a holiday visit and along with all the presents that were wrapped up in pretty packages, my mom handed me a garbage bag and said, "We found these in grandpa's basement and I thought you'd want them." I didn't know whether to be excited or scared. Turns out excited was the correct response. In the bag was a half dozen or so rolled up posters, mainly vintage travel posters. Sadly the years had not been kind to them. Most of the posters were ripped to the point that you couldn't save them and the paper had become so fragile that just unrolling them ripped them more. But there was one poster that survived in almost perfect condition, and it was the best one in my opinion. I did all the research I could, but I can't track down much information about this particular travel poster. 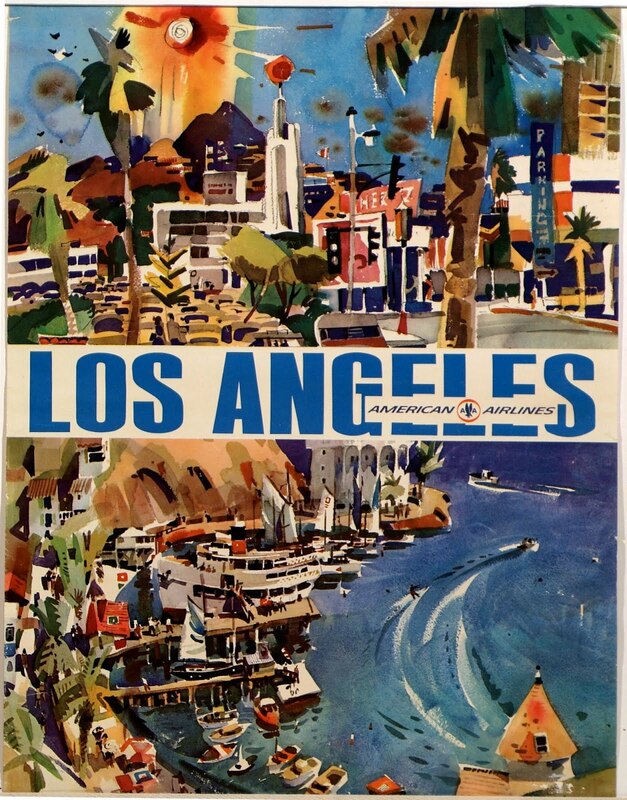 It's obviously an American Airlines poster promoting their Los Angeles destination, but I can't find the artist who did the original water colors and I can't find a signature anywhere on the poster. Multicolor print of a watercolor advertising service to Los Angeles. Reproduction of two images, separated by a white bar containing the text “LOS ANGELES” in a blue sans-serif font and the smaller blue text "American Airlines" with the AA logo. The top illustration portrays a Los Angeles city scene, while the bottom illustration shows a Los Angeles bay lined with boats and houses on the hillside. 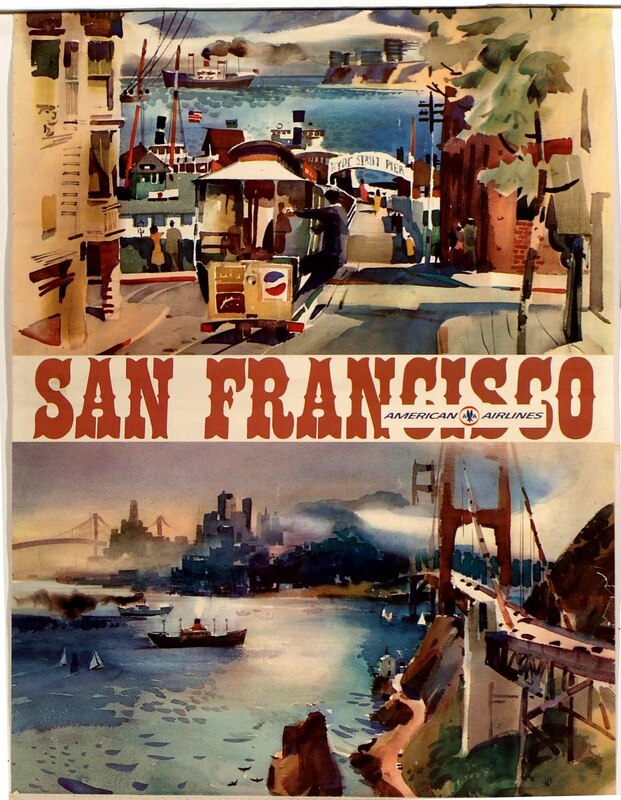 There's also a San Francisco version of this poster, I'm assuming by the same artist, but again, it's listed as orphaned. But now this orphaned work has a home. 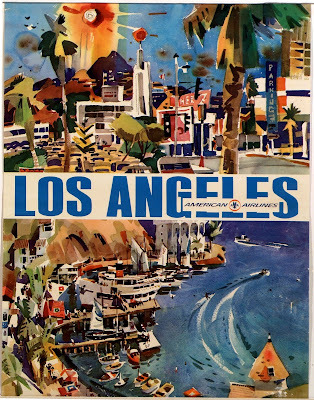 I'm going to get our new vintage Los Angeles poster framed and find a place to hang it in our travel-themed nursery. It's a shame the others weren't salvagable but at least you have this nice piece for your nursery!